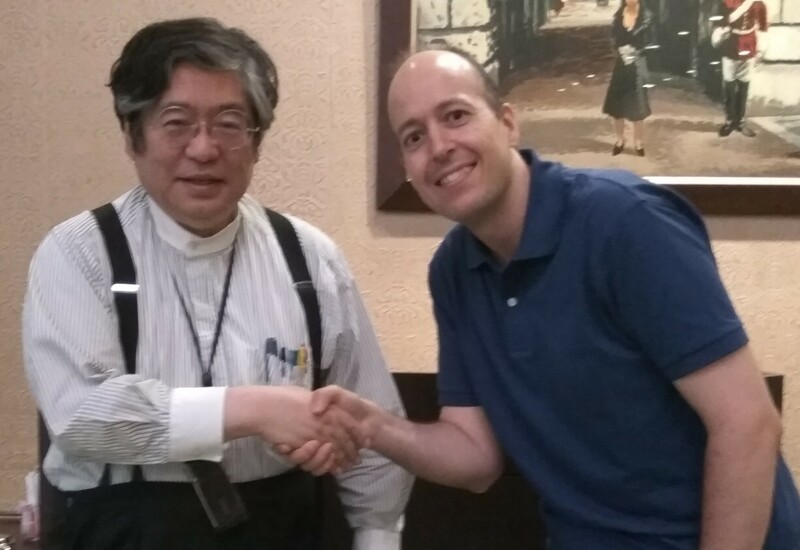 On July 20th and on August 4th this year Konamiman met with Mr. Kazuhiko Nishi in Japan, and amongst other things, they discussed about the licensing rights of MSX-DOS and Nextor. As a result, Mr. Nishi, on behalf of the MSX Licensing Corporation, granted Konamiman permission to publish the source code of Nextor. Two months later, after having agreed on the license text and almost exactly ten years after the project began, Nextor has been published as an open source project in GitHub. This allows anyone not only to take a look at the insides of Nextor (and by extension, to the insides of MSX-DOS), but also to contribute by using GitHub's integrated mechanisms for comments, bug reports and pull requests. Additionally, all of the documentation for Nextor (User manual, Programmers reference and Driver development guide), which was previously distributed as PDF files, has been converted to markdown files inside the code repository. So if you don't feel like contributing to the Nextor code, you can still contribute to the Nextor documentation if you want. To anyone interested in building Nextor locally: I'm sorry for the poor (and Windows-only) build scripts and tools. When I started this project I didn't really expect to be able to publish it in the open some day, so I tailored everything to my own needs. But hey, now you have the opportunity to try and improve that. Great indeed! Thanks a lot for all the efforts, konamiman! Great Nextor, thanks you very much!! Te has hecho una foto con Nishi!? Now you are my leader. Fantastic news, Nestor! Kudos for this historic accomplishment! Let's wish that Nishi-san also releases other parts of the MSX BIOS as open-source too. Specially the more obscure parts like the Kanji driver, MSX-Audio BIOS and RS-232 BIOS. While this is a positive development, I don't think it qualifies as open source: the "no commercial use" and "no derivative works" restrictions in the license conflict with criteria 1 and 3 of the Open Source Definition of the OSI. Great news and thank you Nestor! This is a very big honor for you but also for the whole community. This event shows that MSX grows with the ideas of its members and can grow into the next generation. Thanks to open source the code. And congratulations for your picture with Nishi. As x1pepe says, you are a true leader of society. The god and the leader Thank you for open source it! Fair enough, but "loosely open source" is still shorter than "sources published with some restrictions"
Anyway, IMO the non-commercial restriction absolutely makes sense and the derivative works clause won't be really (or very strongly at least) enforced. It's just that Nishi sama wants to be aware of what's done with MSX-DOS, which I find understandable. Well, I can't deny it is shorter, but it is also incorrect. Wouldn't it be better to say that "sources are now available"? I don't think the non-commercial restriction is needed. It seems very unlikely someone is going make money off Nextor when all MSX users know they can freely download it from your site. Whether you/they plan to enforce the clause or not doesn't really matter; plans can change quickly. The clause is there, so anyone who wants to use the source cannot ignore it. Of course it is Mr. Nishi's right to set whatever restrictions he wants. But it does mean that for example we can't distribute Nextor together with openMSX, because openMSX is included in Debian and these restrictions are not acceptable for them. If the Nextor source would be licensed under an open source license like BSD or GPL, it would be more useful to the community. GPL in particular seems like a good license if you're worried about someone making a derived work and selling it, since GPL states that they must release their modified version under GPL as well. Nestor, that’s incredibly awesome! Many kudos! Several times I’ve wished to see how things were done, or even try and make some modifications. I recall talking to you at some point about the time it took to calculate the free disk space, which I wasn’t able to help you with then because of the closed sources, but in the end luckily you found time to optimise . Also at some point I wondered whether it would be possible to have FAT32 and long file name support. It’s great that now when I get into the mood to look into such things, I will have the ability to do so! Awesome news! I hope this motivates new features on the OS! Sorry to say, but this isn't open source in any way, shape or form. A license like this is usually referred to as "shared source". What counts is the "libre" part. Some of those liberties (inspect the code, make custom changes for yourself, free distribution etc) are there, but some important ones (commercial use, freedom to fork the code) are not. Both of those restrictions require contacting original authors, which in itself is problematic. Original authors tend to go away after time, become unfindable for whatever reason, stop responding to inquiries because they lost interest, etc. Happens ALL THE TIME with many, many software so yes this is a problem. Less so than one might think.. suppose there's some community hardware project that includes this code. Great. Now someone decides to build X pieces of said hardware, at cost. Super! Then builder decides a small profit for his/her efforts should be okay. Is this a commercial business now? In short: "commercial" can be vague / difficult to determine, and thus it's easy to move into grey area - even with the best intentions of everyone involved. Not to mention that "commercial" use can be great even if the #1 intention was to make money. It's just that Nishi sama wants to be aware of what's done with MSX-DOS, which I find understandable. The best way to do that is run an 'official' repository yourself, and maintain it. Like accept patches that fix bugs. Of course the "maintain" part is what rights holders like Nishi don't like, and thus they keep their software closed source. The other option is to hand over maintenance to others, and trust they will help 'your baby' grow & flourish in the great evil world out there. and the derivative works clause won't be really (or very strongly at least) enforced. Then don't have it in the license! Code forks are not scary, and a non-issue for well maintained projects. For projects that are NOT well maintained (and forked as a result), such forks are usually for the better of end users. See for example Xfree86 vs. Xorg or Gnome 2. Forks die quickly because they're difficult to maintain. Or they survive because they do a better job than original maintainers. To any software developers out there who consider releasing code: for any restriction, please consider if it is NECESSARY to achieve whatever you intend that restriction for. If you're not CERTAIN of such necessity, don't put such restriction in place - most likely it will have unforeseen consequences. Didn't mean to rant about Open Source in general... just for people who release code, consider for each restriction whether it's really NEEDED, why, or if there isn't another way to reach objective while still releasing code as open source. What you think is a minor issue, may be a big problem down the road. Anyway: many thanks Nestor for all the work on this you've done over the years! Including setting up this source repository. I explicitly asked Nishi about that. I told him "there's people selling hardware that contains Nextor in ROM and I want this to continue being allowed, otherwise the Nextor project itself makes little sense". He agreed with that, and in fact that's stated in the license. You can sell your hardware with Nextor built-in for whatever price you want. Just don't sell Nextor itself as an standalone product, and don't offer a "premium" version of your hardware that is more expensive because it contains Nextor (I don't think anyone would ever do that anyway). Having said that, of course it might be that the license text is not clear enough on that point. If that's the case, well, we're always on time for improving it! Feel free to suggest an alternative text if you want. Both of those restrictions require contacting original authors, which in itself is problematic. But again, my personal impression is that Nishi doesn't really want to forbid people from further forking MSX-DOS/Nextor, instead he just wants to be aware of when that happens (I might be wrong, of course). I understand your concern about him becoming unreachable or unresponsive, though. Sure! But again, I didn't include these restrictions in the license. I wrote the license text myself, but based on the terms that we had agreed on verbally. There would be no restrictions whatsoever if it depended on me. I didn't really expect to be allowed to publish the sources (no, in fact, I didn't even expect being able to meet with Kazuhiko Nishi himself), so let's celebrate what we have now and try to improve things over time. Can you tell us the story of how you got to meet him? Such a great piece of news! I understand free software concerns, nonetheless something very important for this community is happening! Fantastic ! Thanks a lot Nestor !! a great story worthy of a movie "as nishi found a nestor"